Done in broomstick lace, this shawl crochet pattern creates a truly elegant wrap for night or day. This triangle crochet shawl pattern includes a floral motif border. Follow the diagram for easy assembly of this intermediate crochet pattern. The Broomstick Lace Shawl shows you how to crochet a beautifully delicate shawl that is lacy yet warm. This stunning shawl is an easy way to add elegance to just about any outfit all the while keeping your shoulders warm and toasty. If you have never used a crochet shawl pattern this is a fabulous place to start. If you are brand new to crochet patterns, check out our collection of beginner crochet projects and helpul tutorials for first-timers: 50+ Free Easy Crochet Patterns + Help for Beginners. Each completed motif measures 4"/10 cm. The shawl includes rows of Broomstick (Jiffy) lace. There are two steps in working Broomstick lace. First, loops of stitches are extended and placed on a large knitting needle (the broomstick). Next the loops are worked off the needle with single crochet. In Broomstick lace, there are many different ways to hold the large knitting needle. Experiment with different grips and placement of the large knitting needle to find a position that works for you. Row 1: Sc in second ch from hook and in each remaining ch across, turn—3 sc. Row 2 (RS): Ch 1, working in front loops only, sc in each st to last st, 2 sc in last st, turn—4 sc. Row 3: Ch 2, turn, sc in second ch from hook; working in front loops only, sc in each sc across, turn—5 sc. Rows 4 and 5: Work Rows 2 and 3—7 sc. Row 6 (opening loops): Hold knitting needle close to work. Extend loop on hook slightly and place on knitting needle. *Working in front loops only, insert hook in next sc, yarn over and draw up a loop, extending the loop slightly place loop on the knitting needle; repeat from * to last sc; insert hook in front loop of last sc, yarn over and draw up a loop, place loop on the knitting needle, insert hook in back loop of last sc, yarn over and draw up a loop, place loop on the knitting needle, turn—8 loops on needle. Row 7 (closing loops): Working loosely, insert hook in first loop on knitting needle, yarn over and draw up a loop; ch 1, 2 sc in same loop; remove loop from knitting needle, *sc in next loop on knitting needle, remove loop from knitting needle; repeat from * until all loops are removed from knitting needle, turn—9 sts. Row 8 (RS): Ch 1, working in front loops only, sc in each st to last st, 2 sc in last st, turn—10 sc. Row 9: Ch 2, turn, sc in second ch from hook; working in front loops only, sc in each sc across, turn—11 sc. Rows 10–69: Repeat 4–9 ten times—71 sc. Row 70: Ch 1, working in front loops only, sc in each st across to last 2 sts, sc2tog, turn—70 sts. Row 71: Ch 1, working in front loops only, sc2tog, sc in each remaining st across, turn—69 sts. Row 72: Hold knitting needle close to work. Extend loop on hook slightly and place on knitting needle. *Working in front loops only, insert hook in next sc, yarn over and draw up a loop, extending the loop slightly place loop on the knitting needle; repeat from * to last sc; leave last sc unworked, turn—68 loops on needle. Row 73 (closing loops): Working loosely, insert hook into first 2 loops on knitting needle at the same time, yarn over and draw up a loop; ch 1, inserting hook into first 2 loops at the same time, work 1 sc; remove loops from knitting needle, *sc in next loop on knitting needle, remove loop from knitting needle; repeat from * until all loops are removed from knitting needle, turn—67 sts. Row 74: Ch 1, working in front loops only, sc in each st across to last 2 sc, sc2tog, turn—66 sts. Row 75: Ch 1, working in front loops only, sc2tog, sc in each remaining st across, turn—65 sts. Rows 76 and 77: Repeat Rows 74 and 75—63 sts. Rows 78–137: Repeat Rows 72–77 ten times—3 sts. Row 138: Ch 1, working in front loops only, sc in first st, sc2tog—1 st. Fasten off. With WS facing and point facing upwards, join yarn with slip st in lower side corner. Row 1: Ch 1, working along lower edge of shawl base, work 133 sc evenly spaced to point of shawl, 2 sc in point, work 133 sc evenly spaced to opposite corner of shawl base—268 sc. Fasten off. Round 1: Ch 1, work 7 sc in ring; join with slip st in first sc. Round 2: Ch 8, slip st in same st as join, *(slip st, ch 8, slip st) in next sc; repeat from * 6 more times; (sl st, ch 4, tr) in first sc (at base of beginning ch-8). Round 3: Ch 1, sc in space formed by last st of previous round, ch 2, (2 dc, ch 2, 2 dc) in next ch-8 space, ch 2, *sc in next ch-8 sp, ch 2, (2 dc, ch 2, 2 dc) in next ch-8 sp, ch 2; repeat from * 2 more times; join with slip st in first sc. Round 4: Ch 1, sc in same st as join, 2 sc in next ch-2 sp, sc in next 2 dc, (2 sc, ch 2, 2 sc) in next ch-2 sp, sc in next 2 dc, 2 sc in next ch-2 sp, *sc in next sc, 2 sc in next ch-2 sp, sc in next 2 dc, (2 sc, ch 2, 2 sc) in next ch-2 sp, sc in next 2 dc, 2 sc in next ch-2 sp; repeat from * 2 more times; join with slip st in first sc. Fasten off. 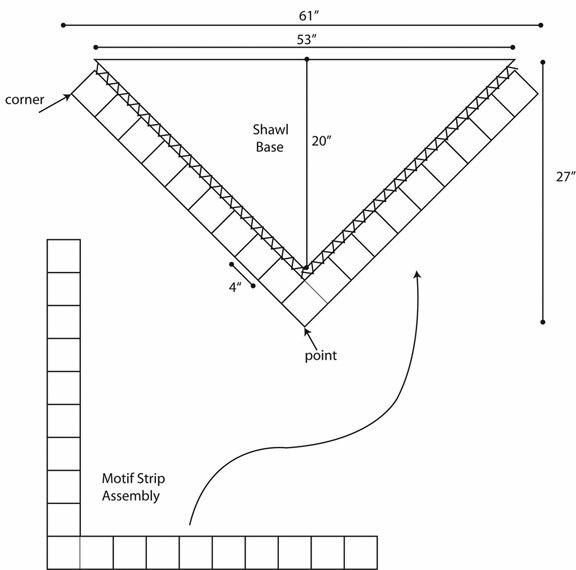 Arrange motifs according to assembly diagram. Using yarn needle, whipstitch motifs together. With WS facing, join yarn with slip st in inner corner of first motif of strip. Row 1: Hold piece to work along inner v-edge of motif strip; ch 1, working along inner edge of motif strip, work 268 sc evenly spaced across inner edge to opposite corner of motif strip, turn. Row 2 (opening loops): Hold knitting needle close to work. Extend loop on hook slightly and place on knitting needle. *Working in front loops only, insert hook in next sc, yarn over and draw up a loop, extending the loop slightly place loop on the knitting needle; repeat from * across, turn—268 loops on needle. Row 3 (closing loops): Working loosely, insert hook in first loop on knitting needle, yarn over and draw up a loop; ch 1, sc in same loop; remove loop from knitting needle, *sc in next loop on knitting needle, remove loop from knitting needle; repeat from * until all loops are removed from knitting needle, turn—268 sts. Fasten off. Align sts of Row 3 with sts of shawl edging. Using yarn needle, whipstitch shawl base and motif strip together, sewing through corresponding sts. Note: The shawl has two side corners and one point. The corners are located at each side and correspond to the outer corners of the first and last motifs of the motif strip. The point is located at the lowest point of the shawl and corresponds with the lowest point of the center motif of the motif strip. With RS facing, join yarn with slip st in any st along edge of shawl. Round 1: Ch 1, work sc evenly spaced around entire shawl, working 3 sc in each corner and point of shawl; join with slip st in first st. Round 2: Ch 1, sc in each sc around, working 3 sc in each corner and point of shawl; join with slip st in first st. Fasten off. Wow. This shawl in broomstick lace is so gorgeous!!. I just looove the color used, old rose. I love old rose but this color chooses its design. This project takes the shawl to another level really. It's so classy. It is just such a beautiful shawl I had to have the pattern. Thank you so much for sharing. I am having trouble with the last part of Round 2 and the first part of Round 3 for the Motif. Please help. I've this shawl before, working from a pattern that was on the back of a skein label. What a joy it is to find it in a print version that I don't need a microscope to read! Just for clarification, this is a version of broomstick lace which I created myself. It's not hairpin. This broomstick lace works with a BIG knitting needle and crochet hook. Hairpin lace uses a loom that you work with or a old hair pin if you want something delicate. this is hairpin lace that i would love to learn. do you have printouts for this? Just looking at this shawl I can't wait to get it done. I love crocheting and what makes this a nice project is that I know when I go to see my sister in Australia it will be a nice evening wrap and if I can do it I will be making my sister one as well in her fav colour. This shawl is so nice. The neat thing is that it would look great with jean or with formal wear! Not only that but because it is light enough it won't make you hot when you go indoors.